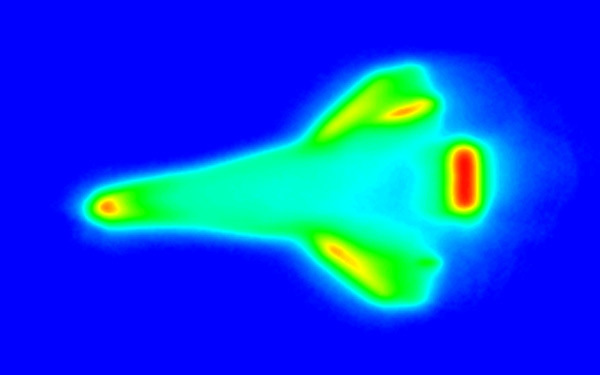 NASA researchers are capturing thermal images of the space shuttle during reentry to design better heat shields. Slideshow: The initial images captured by the Navy’s infrared optical system, Cast Glance, are black and white. This one shows the space shuttle Discovery, during mission STS-128, reentering the Earth’s atmosphere on September 11. Slideshow: The NASA team uses temperature data to produce full-color images that reveal shuttle reentry heating patterns–blue being the lowest temperatures, red the highest. This image shows Discovery during mission STS-128. 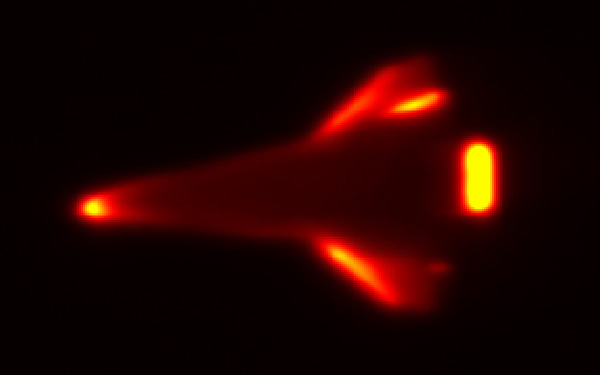 Slideshow: This image, also of Discovery during mission STS-128, shows heating patterns during the “boundary layer transition” (BLT) experiment, when NASA researchers added a small bump to the wing (top of the image, just below the wing’s leading edge) to cause turbulent flow. 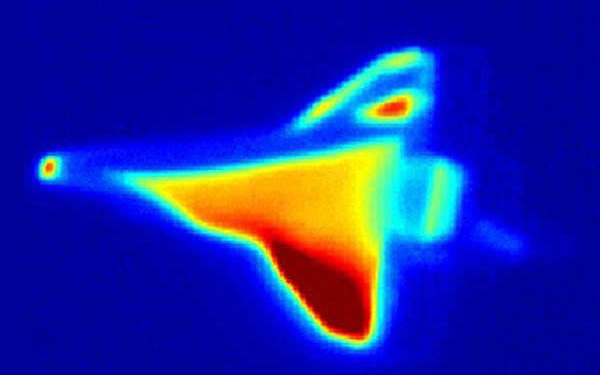 Slideshow: A thermal image of the space shuttle Atlantis, taken during mission STS-125 in May, shows hot spots on the spacecraft’s underside, at the nose and wings. 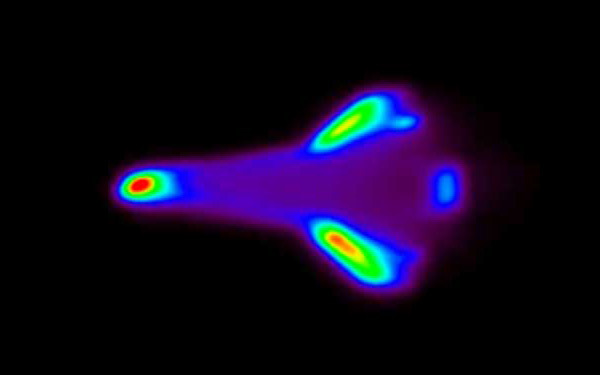 This image marked the first time a thermal image has been captured at such high speeds–the Cast Glance crew caught Atlantis going almost fifteen times the speed of sound (about five miles per second). Slideshow: This image of Discovery was captured during mission STS-119 in March, while the shuttle was traveling at three miles per second. The small triangle of red on Discovery’s lower wing (at the top of the image) was caused by the BLT experiment. The larger heating area (at the bottom of the image) came from an unexpected source. 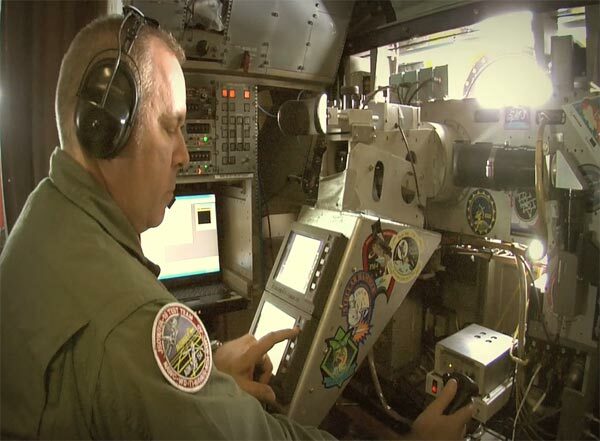 Slideshow: The Cast Glance optical system is operated here by mission director Steve Tack. He has to manually track the space shuttle and guide the aircraft’s pilots. The Navy aircraft flies as close as 37 kilometers from the shuttle as it images its underbelly.